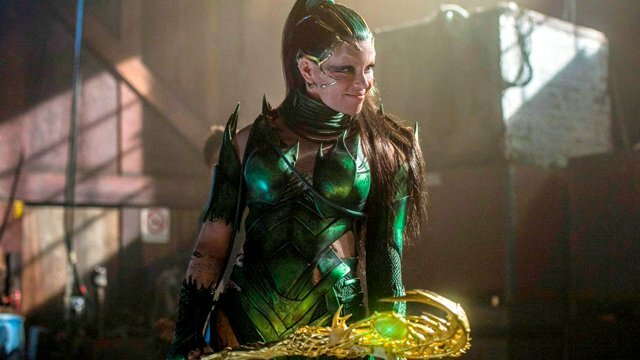 Lionsgate has brought online a new Power Rangers movie spot with the focus of this video being on Elizabeth Banks‘ villainous Rita Repulsa. Check it out in the player below! Meanwhile, the film’s promotion has also released an online interactive Alpha 5. Alpha chats with users as though they’ve been chosen as Power Rangers and will personalizing the story to fit your replies. The Power Rangers cast also includes Dacre Montgomery (A Few Less Men) as Jason the Red Ranger, RJ Cyler (Me and Earl and the Dying Girl) as Billy the Blue Ranger, Naomi Scott (The 33) as Kimberly the Pink Ranger, Becky G (Empire) as Trini the Yellow Ranger, Ludi Lin (Monster Hunt) as Zack the Black Ranger, with Bill Hader (Saturday Night Live) voicing Alpha 5 and Bryan Cranston (Breaking Bad, Godzilla) as Zordon. What do you think of this Rita Repulsa spot? Are you planning to check out the film on the big screen? Let us know your thoughts in the comments below!